Would you agree to downsizing? Would you shrink down to the size of a ball-point pen? That means you’d lose roughly 99 percent of your body mass in a blink. It seems crazy. But what if I reminded you that you’d immediately eliminate the bulk of your living and travel expenses. It’s good for the environment too, as you’d reduce your carbon footprint. Plus, a few of your friends recently did the procedure, and they swear it’s the best decision they ever made. They live like royalty. That’s the premise behind Downsizing, an ambitious social satire starring Matt Damon and Kristen Wiig. Perhaps you’ve seen the cute commercials, set to retro Talking Heads music, and likened it to a sublime and provocative version of Honey, I Shrunk Matt Damon. I’m here to tell you that everything you think about this movie is wrong. Cowriter and director Alexander Payne (Nebraska, The Descendants, Election) takes that intriguing concept and inexplicably flushes it down the toilet. Downsizing doesn’t just shuffle along to the middle. The second-half execution is an epic fail, nonsensical in its plotting and disturbing in its venom for other human beings. I fought every instinct to not walk out of the theater. Be extra-frustrated knowing that the first 40 minutes are a breeze. Damon’s Paul is an affable-but-shlubby drone in Nebraska. He’s married to the equally pleasant Audrey (Wiig). Stuck firmly at the wrong end of the economic ladder, they can’t mask their overall disappointment in life. So when they spot their friends, also a couple, happily arriving to an event in their own enclosed casing, the lightbulb goes off. His pals have been downsized — a recent medical breakthrough that enables a person to shrink to a mere five inches tall. The procedure is so popular that three percent of the world’s population are now small. Minis live in their own lush neighborhood. They’ve eschewed their belongings. Simplifying is the new American dream. The pair decides to go for it. 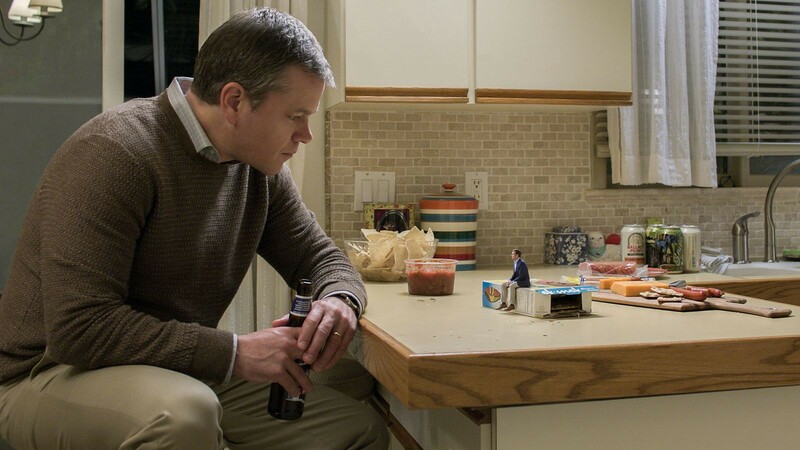 These are Downsizing’s best scenes by far. And the meticulous shrinkage process fascinates. First you must get your metal dental fillings removed or else your head will explode. Then you’re completely shaved to look like a baby’s bottom. In the most amusing sequence, full-sized nurses transfer the new miniatures via kitchen spatulas. The sight of Damon eyeing an enormous saltine cracker to snack on is a cheap, albeit effective, laugh. Something is bound to go wrong. And it does. I thought for sure Damon and Wiig would learn of a ghoulish and sinister underbelly in Smalltown USA. Or the couple is forced in live with full-sized adults and proceed to emotionally wither away. (One barfly notes that Damon shouldn’t be allowed to vote anymore because he won’t be participating in the economy.) Wrong on all counts. Wiig exits the movie (trying to be vague) and Damon is left on his own. He befriends an eccentric wealthy neighbor (Christoph Waltz), who wants him to become more bon vivant. Waltz’ arrival signals the exact moment of Downsizing’s rapid free fall. Characters are tossed aside. Sturdy plots are tossed aside. Even the visual gimmicks go away. We clean up the mess. The chaotic zig-zagging story (written by Payne and Jim Taylor) goes to new places with wild, irresponsible abandon. This is a would-be hero’s journey in which everybody is the villain. Damon is pathetic, not sympathetic. Waltz is even more despicable. You will not care about any of them. Payne and cowriter Jim Taylor seem to think they’ve made a grand statement on American materialism and white privilege. It’s not. Among the offenses? A downsized woman named Ngoc Lan Tran (Golden Globe nominee Hong Chau), who smuggled herself in the U.S. in a TV box and lost part of her leg in the process. Now she cleans houses and lives in a pocket-sized, downtrodden, primarily Hispanic neighborhood. She spews tart insults at Damon and the rest of the upper class in broken English that’s intended to be funny. It’s even more cringe-worthy than it reads. This character represents casual racism at its most blatant. Forget the allegories and heavy-handed messages. Just tell the intimate story of a simple, boring guy struggling to find an easy escape. Good things can come in small packages. This is not one of those instances.